It is common cause that the performance of South Africa’s government, led by the African National Congress (ANC), has been worse than abysmal. Under former President Jacob Zuma, ANC functionaries pillaged numerous institutions of state. They enabled state owned institutions to be looted, mismanaged the provision of basic services and presided over an alarming downward spiral of the economy. Evidence keeps mounting of dishonesty and profligacy. The unfolding scandal around VBS Bank has shone a spotlight on the ANC as a nest of thieves. In addition, a commission of inquiry is relentlessly exposing how Zuma’s henchmen amassed huge riches from state capture. And another inquiry into the South African Revenue Services is revealing how the state’s capacity to raise revenue from the politically powerful and influential was systematically undermined. All in all, the ANC has completely forfeited its right to be reelected in 2019. It knows it, and is running very scared. But the odds are that it will still win, even though with its smallest majority yet. What the party does have going for it is its president Cyril Ramaphosa. He is the ANC’s one big pull. And much to the chagrin of the Zuma faction, the party is going to have to build its election campaign around him – precisely because he is far more popular than the party. Indeed, South Africa can expect the 2019 election to bring the most presidential-style campaign yet. The irony is that Ramaphosa will privately welcome a smaller rather than a larger ANC majority. A thumping reduction in the ANC’s vote will serve as a popular rebuff of the Zuma faction, and erode its base in the party. An ANC which knows that it may have lost its majority had it not been for Ramaphosa’s personal popularity will be an ANC in which he will at last be able to assert his authority. 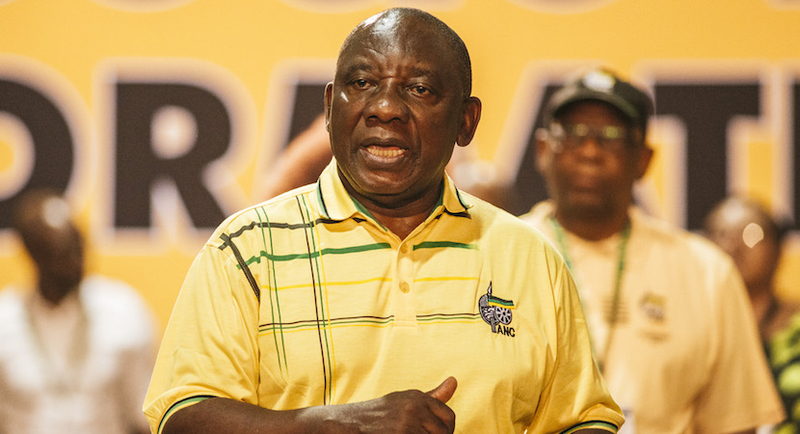 Ramaphosa sits atop a party which has long been in a state of internal factional turmoil. He defeated his rival for the presidency, Nkosazana Dlamini-Zuma, at the ANC’s five yearly congress with an excruciatingly narrow vote. He lacks control over the party’s national executive (its highest decision-making body between conferences) where Zuma’s supporters remain strong. And, he is facing a robust fight back campaign by Zuma’s acolytes in provinces around the country. Zuma himself, like Banquo’s ghost, remains an ambiguous and dangerous presence. He professes innocence of all crimes as well as continuing loyalty to the party. But, behind the scenes he’s seemingly still pulling the strings of his puppets. With the party in a state of continuing internal war, the scramble for positions on both its national and provincial electoral lists will be overt, in some places violent, and overall, very probably, embarrassing. Nonetheless, come the election campaign, it is more than a little likely that its competing factions will forge something of a truce, and preach a new-found unity. The ANC may be divided over policies, positions and spoils, but one thing it is united about is the necessity of retaining power. It will prove ruthless in doing so. One of the few things it knows how to do well is to run an election campaign, and how to induce or scare its popular constituency into voting for it. Even so, it is uncomfortably aware that its base is eroding. The loyalty of its traditional supporters is declining; it is failing to attract support among “born-frees” (those born after Mandela’s release in 1990); its narrative of having liberated the country from apartheid is wearing tired and thin; and the different commissions of inquiry are going to uncover more and more dirt as the campaign goes on. So, what is the party going to be doing to win back the vote of the disillusioned? ANC elections head Fikile Mbalula recently acknowledged that the party has allowed itself to become mired in “the sins of incumbency”, to have become distanced from its base, arrogant and unaccountable. Under Ramaphosa, therefore, it will be making fulsome promises of renewal. The ANC will claim that the establishment of the various commissions of inquiry signal a determined assault on corruption, and indicate that the party’s bad apples will be thrown out. Meanwhile, in all humility, the ANC is promising to renew its bonds with the people. This will involve a country wide process of consultation with what Mbalula has referred to as “strategic sectors of society” in a bid to “broaden and deepen participation” the drawing up of a “People’s Manifesto”. Amid all this, the party will be promising to build on Ramaphosa’s various reform initiatives to return the economy to growth. The ANC’s major problem is that none of this is going to be particularly convincing. The gospel of the party’s commitment to virtue and renewal is going to be a hard sell to a corruption-weary electorate. Its base divided and increasingly cynical, the ANC knows that it is going to have to look for support beyond its normal boundaries. It knows all too well that it is likely to lose important ground to the radical Economic Freedom Fighters. It knows that it may have a hard time in getting the voters out in KwaZulu-Natal, where support for Zuma remains strong. It knows that many of its traditional supporters may be tempted to record their disgust with the party by staying at home. Given all this, the ANC knows that it will have to play to Ramaphosa as its one major asset. A Ramaphosa-centred strategy is likely to work because there is no credible alternative as a party of government to the ANC. The main opposition Democratic Alliance will again go unchallenged in the Western Cape, and may do surprisingly well in provincial elections in provinces such as Gauteng and Eastern Cape, based upon its “better-than-the-ANC” record in local government. But at the same time it may well suffer at national level because its conservative constituency fear the prospect of the ANC losing its majority and being forced into a coalition with Julius Malema and the EFF. In short, some will hold their noses, and vote for Ramaphosa and the ANC. Roger Southall, Professor of Sociology, University of the Witwatersrand. This article is republished from The Conversation under a Creative Commons license. Read the original article.